Ask one person for feedback, and it's hard to know whether they represent the majority or minority. Ask a hundred, though, and you'll start to see a clearer picture. Whether you're designing a new product, improving your site, or just wondering if more people like oranges or bananas, your best bet is to ask people. A lot of them. And to do so at scale, you'll need a survey. We researched the most popular and most powerful survey apps, and we narrowed it down to the 11 best. Need a form builder instead? A survey casts a much wider net, allowing you to ask dozens of different questions. 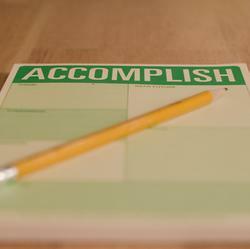 A form, on the other hand, is used to collect very specific information. Jump back to Chapter 2 to find the best online form builders. 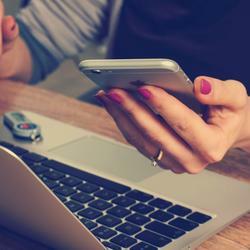 What Makes a Great Online Survey App? 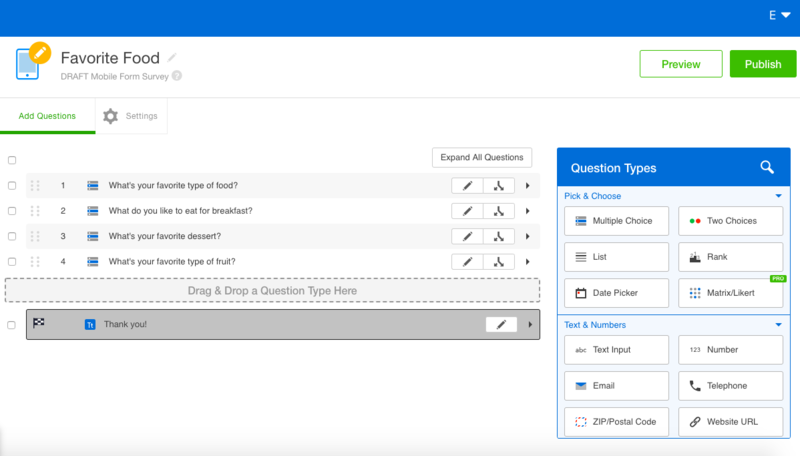 Any survey app worth its salt includes standard tools to customize question type, add logic and branching, distribute the survey via a variety of channels, and analyze the data you collect. The apps on this list offer more than that. They help you tackle advanced techniques, like managing events, collaborating with a large team, automating your workflow, and ensuring your survey is accessible. This roundup focuses on survey tools offering standout features above and beyond the basic survey capabilities, with an emphasis on apps that make it easy to get started. We've focused on survey tools that cater to a broad audience and a wide range of use cases, so we have omitted survey tools that solely focus on NPS scores or customer feedback. Tired of navigating between windows to see a preview of your survey and make edits? SurveyPlanet takes away the extra clicking by showing you a live copy of your survey that you can fill out, right in the same window where you're editing your survey. The editing panel is a thin column on the left side of the screen and, as you add your survey title, choose from nine question types (e.g., from multiple choice to an image-based question), and input questions, the right side of the screen will display and populate your survey in real time. SurveyPlanet makes editing fast in other ways, too. By default, for each question you enter, you'll see one text field below it to type in a response. 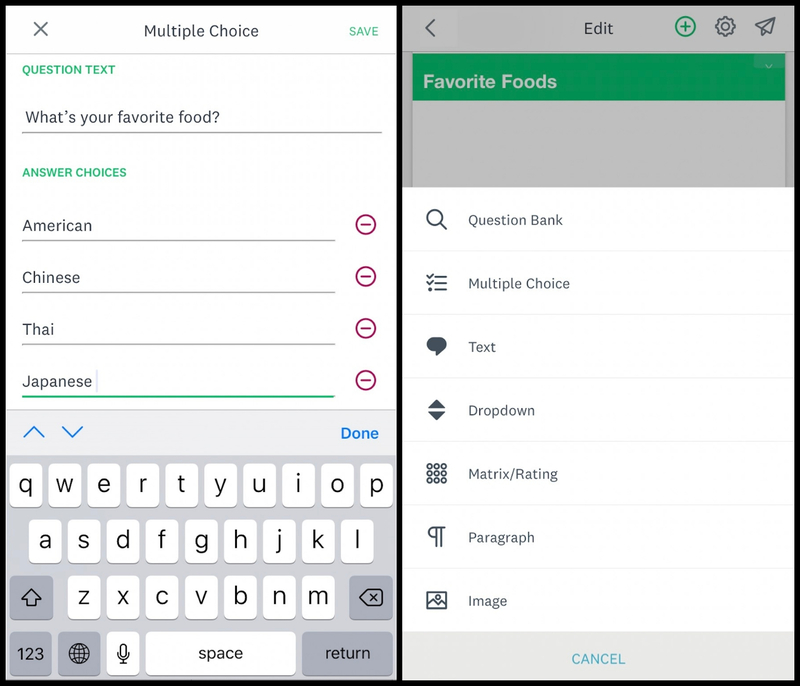 But, if you choose Multiple choice, Rating, or Form as your question type, you'll automatically see additional text fields appear as you begin typing the first response option. This lets you quickly add responses to each question without having to click the + button or press Enter on your keyboard. With this streamlined editor and these types of shortcuts, we were able to create a 10-question survey in under five minutes. SurveyPlanet Price: Free for unlimited surveys and responses; $20/month for the Pro plan that includes features like uploading images, question branching, and exporting results. One of the biggest names in survey apps, SurveyMonkey also offers the best mobile survey experience. While most survey apps just let you collect responses on mobile, SurveyMonkey allows you to create, edit, gather responses, and analyze results on your smartphone or tablet. And anything you do on mobile will sync with your desktop account and vice versa. Rather than forcing the desktop experience to fit on a smaller screen, the entire process has been redesigned and reimagined. The interface is simple and clean, with big buttons guiding you through the creation process. Each question gets its own page in the editing phase, letting you clearly see and organize the survey's flow. If you want to reorder the questions, no problem. Just tap and hold the page number, and drag it to its new position. When you're done building the survey, you can send it via email, text, or WhatsApp, or share it on social media. As responses start coming in, you can see the total number of responses and completed responses and dig deeper into the data with a pie chart that shows the number of responses to each individual question. This level of analytics is rare on mobile, but SurveyMonkey has figured out a way to let you drill down into the details, even on a small screen. SurveyMonkey Price: Free for surveys with up to 10 questions; from $32/month (billed annually) for unlimited questions and surveys. 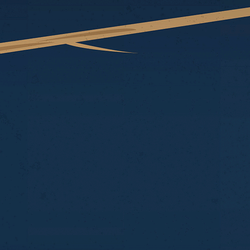 Automate SurveyMonkey with SurveyMonkey's Zapier Integrations. If you want a highly customizable survey builder or need to gather confidential data, LimeSurvey offers one of the most popular solutions. It's an open source survey project that lets you build detailed surveys and host them on your own servers. Open source software, like LimeSurvey, combines the benefits of scalability and low costs, allowing everyone on your team to have access to the tool. 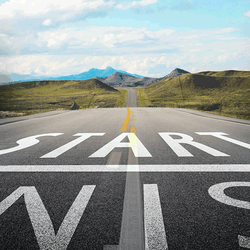 LimeSurvey offers just about any feature you could want, although the getting started process is different. Once you sign up, you need to "create an installation," which generates a free survey instance for your account. In doing so, you'll choose a domain name that best represents your survey and select the server location to determine where your collected response data should be stored. Then, you'll automatically be redirected to the admin interface where you can create a survey. It's not going to win any fashion awards, and it'll take far longer to figure out how to use than any other app in this roundup—you'll have to dig through menus to set things up, add question groups, and then tack on individual questions. But if you want a survey builder that's 100% free and is deeply customizable, and you have the technical know-how, LimeSurvey offers more robust functionality than you can find even in paid survey tools. And, thanks to the open source community, it also supports more foreign languages (more than 85!) than you'll find in other survey tools. LimeSurvey Price: Free; from $35 for 3 months for premium features like access to additional survey design templates. Some surveys are best filled out offline, like QA assessments inside factories. Other times, you may have weak internet connectivity and have no choice but to run an offline survey. Whatever the reason, QuickTapSurvey offers a way to build offline surveys that may even be better than online ones. You can create your own survey or choose from more than 50 customizable templates based on survey category, like employee exit survey or post-event feedback. If you build a new survey, you can select a "face-to-face survey" that shows one question at a time or a "mobile form" that allows you to run mobile-only surveys and shows all questions in a list. When it's time to build your survey, you drag and drop different question elements from a floating toolbar, like ratings, text and number fields, and more. Once you complete your survey, click Publish and then log in to the QuickTapSurvey app on your smartphone or tablet and download your newly published survey to collect responses. The survey can be filled out offline and synced back to your account automatically when you're online again. QuickTapSurvey Price: From $19/month for the Individual plan that includes unlimited surveys and responses but limited question types. Automate QuickTapSurvey with QuickTapSurvey's Zapier Integrations. When creating a survey, it can be easy to get carried away with logic, question branching, and the sheer number of questions to respondents. YesInsights forces you to keep things simple by forcing you to create one-question surveys that respondents can answer with just one click. That's right—you can only create surveys with one question, which allows you to collect very precise responses. The setup process is simple. You choose between a regular survey or an NPS survey and whether you'd like to email out your survey or use a beta widget that displays it on your website. Then you're ready to draft your one-question survey. If you chose to distribute your survey via email, you can create a landing page that respondents see after they click their answer or set up a triggered follow-up email. When you're ready to distribute your survey, you select your email service from more than 35 options, and YesInsights will provide the plain text and HTML for you to copy and paste into your email client. YesInsights Price: From $20/month for the Personal plan that includes five surveys and 1,000 responses/month. Automate YesInsights with YesInsight's Zapier Integrations. When you're planning an event and need people to RSVP, you might first think of using a more flexible form builder to make a signup form. 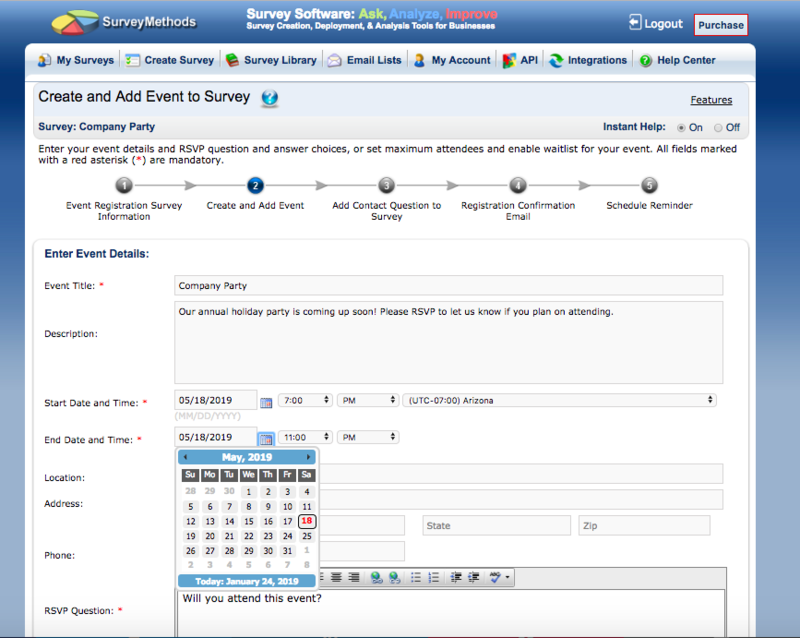 SurveyMethods, though, thinks a survey is the perfect thing for the job with its "Event Registration" surveys. When you create a new survey in SurveyMethods, you can follow a special workflow just for events. As you're building your survey, you can set the event title, description, start and end dates and times, and address, which will appear as bolded text at the top of your survey. You can also choose to collect invitee contact information, like email address, so you can send an automated confirmation email to whoever RSVPs "yes" or "maybe." Closer to the event date, if you distributed your survey via SurveyMethods' "email launch method," you can send automatic reminders to make sure everyone remembers to attend. When your event survey is ready, share a link or send an email through SurveyMethods to gather responses. Invitees can RSVP directly in the survey, add the event to their calendars in Google, Outlook, Yahoo, and iCal, and bookmark your event details page. SurveyMethods Price: Free for 500 monthly responses; from $9/month for the Advanced plan that includes unlimited responses and surveys. Automate SurveyMethods with SurveyMethod's Zapier Integrations. Surveys often offer incentives for respondents to finish answering every question, but that usually means respondents have to enter their contact information into a question field and someone has to manually select the winners from that list. 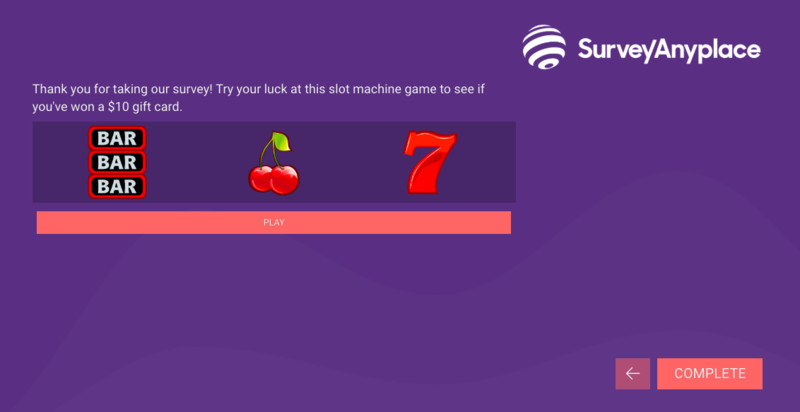 With Survey Anyplace, you can gamify this process by using a digital scratch card or digital slot machine to let respondents know instantly if they've won a prize. If you select the scratch card question type, you are first prompted to enter a message that respondents will see at the top of the page (Survey Anyplace recommends this message provide information about the available prizes and/or how many prizes are available). You can then use the default scratch layer (the image that will appear on top of an image that respondents will have to scratch away) or upload your own. Then, you choose what the "surprise answers" will be and the probability to get each answer. The default surprise answers are "won" and "lost," both set at 50% probability. You can use the provided winning and losing images, or upload your own. When respondents get to this question in the survey, they use their mouse to click on top of the image and drag their mouse over the image to "scratch" it off. The slot machine works similarly, but with far less customization. You're able to enter a message and customize the probability to win, but that's it. The slot machine itself stays the same with the classic bar, cherry, and seven symbols. When respondents get to this question in the survey, they click a big red button that says Play and watch the slot machine turn. For both the scratch card and slot machine, it's important to note that you are responsible for purchasing and shipping any prizes to the respondents. Survey Anyplace Price: Free for 20 monthly responses and the digital scratch card; from $29/month for the Essential plan that includes 400 monthly responses, the digital scratch card, and the digital slot machine. Automate Survey Anyplace with Survey Anyplace's Zapier Integrations. A successful survey is all about distribution—making sure the right people know about your survey and answer all your questions. Surveybot lets you leverage your already established network on Facebook to create and distribute your survey via Facebook Messenger or Facebook Workplace. When you sign up for Surveybot, you either sign up using Facebook Messenger or Facebook Workplace, or create an account manually and connect your Facebook account later. Building the survey itself is easy—you can customize welcome and thank-you messages, then drag and drop question types into the editor. You'll see a live preview of your survey appear as you type your questions. You can choose certain logic, like ending the survey if someone responds with an invalid answer, or set reminders if respondents haven't completed the survey after X amount of days. The real fun starts at the campaign stage, where you choose how to distribute your survey on Facebook. If you didn't connect your Facebook account to Surveybot or don't have a Facebook Page associated with your Facebook account, you can only generate a link that you can share via any channel (like email) and it will open your survey in Messenger. If you do have a Facebook Page, you have a variety of options. When you're in the Campaign phase of Surveybot's editor, you can choose to automatically message users with your survey when they comment on a post or click on your ad. Once users begin answering your surveys with Surveybot, they'll automatically be added to a "panel," a segment inside Surveybot that shows all previous respondents. When you have enough users in your panel, you could send a direct message over Messenger about your new survey. And lastly, you can trigger surveys to launch when someone completes another survey, when a respondent enters a panel segment, or by calling the Surveybot API. Surveybot Price: Free for the first 50 responses; $6 for every 100 subsequent responses. Automate Surveybot with Surveybot's Zapier Integrations. Collaborating on survey creation can be a frustrating task—you usually have to share one set of account credentials or make sure you don't override each other's work. You're almost better off working on a list of questions together in a Google Doc, then having one person build the survey. SmartSurvey, though, gives you an easier option with its shared file and question libraries. Everyone on your team can add questions and multimedia (like files or logos) you want to include in a survey and share those assets with each other. Then, when it's time to make the survey, click the Add Question from Library button when building the questions. Finally, you can share your results page with a password-protected link or export the survey results so everyone has access to the findings. SmartSurvey Price: Free for 15 questions per survey; from £25/month for the Pro plan that includes for unlimited surveys and questions and 1,500 responses/month. Automate SmartSurvey with SmartSurvey's Zapier Integrations. Building and sending surveys is often an exercise in how quickly you can clone an existing survey, make a few necessary edits, and send to the same group of customers. Client Heartbeat eliminates the tedious, manual work and automates the entire process for you. After you've signed up, you're prompted to set up your company by adding business location, industry, the size of your company, and selecting how often you want to get feedback from six defined intervals. Next, you can create your own set of questions or use the default questions, including "How satisfied are you with the speed and efficiency at which we are able to respond to your requests? "; all questions are on a 1-10 scale. Finally, you import your list of customers from a CSV file, connect with an external CRM like Salesforce, or manually add a single customer's information. 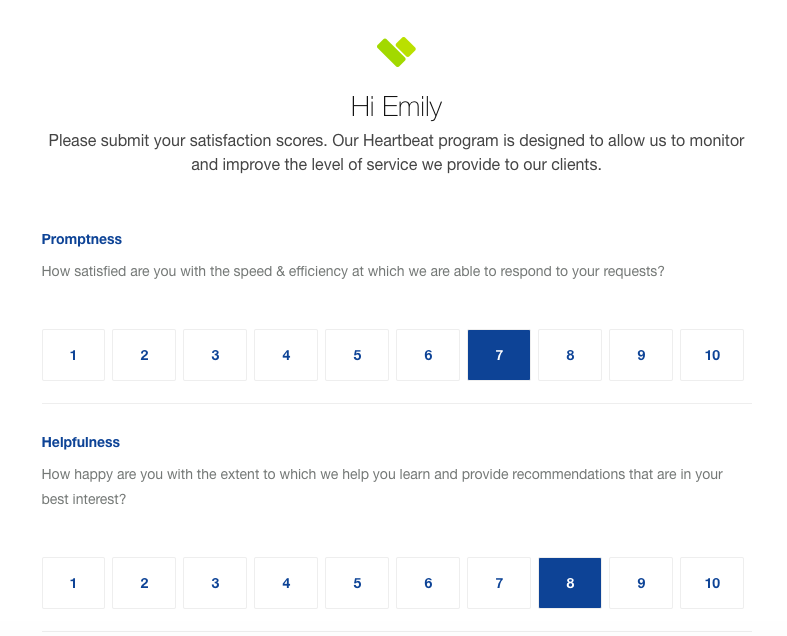 Client Heartbeat takes care of the rest, automatically sending the same survey via email on the schedule you selected. The results tab will aggregate all the survey responses, compare your scores against industry averages if you used the default questions, and flag customers you're at risk of losing. Client Heartbeat Price: From $29/month for the Basic plan that includes unlimited surveys. You put time and energy into finding the right survey tool, coming up with questions, and building the survey. In the end, you can only hope that respondents can and will participate. With SurveyGizmo, however, you can test your survey before you send it out to ensure it's successful. The Survey Diagnostics tool uses data from other surveys in SurveyGizmo to estimate "survey length" (how many minutes it takes for someone to complete your survey), "fatigue score" (how long or complex your survey is), and "accessibility score" (how user-friendly your survey is). After you've built your survey, you navigate to the Test tab to access the Survey Diagnostics. You'll see meter icons made up of green, yellow, and red segments to indicate your fatigue and accessibility scores. Estimated length and fatigue scores are based on the number of survey questions and their complexity, while the accessibility score is an indication of how many questions may present usability issues. You can even automatically generate test responses or invite others' feedback on your survey. That way, you'll get a polished survey others are sure to fill out. SurveyGizmo Price: Free for up to three surveys; from $35/month for the Explorer plan that includes unlimited surveys and responses. 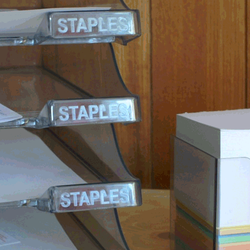 Automate SurveyGizmo with SurveyGizmo's Zapier Integrations. There are dozens of tools to build surveys, with many others that we didn't include in this roundup. If you're working in a large enterprise that has more advanced needs from your survey, you might find tools like Qualtrics, MaritzCX, or Adobe Marketing Cloud are better options. If you're a student or conducting academic research, SoGoSurvey is a popular option. Or you might already have an app that includes a survey builder. Many form builder apps include survey templates, and all could be used to make a survey with a little extra work. Marketing automation tools—including email marketing apps like Constant Contact—also often include survey builders, so if you're already using one of them for your marketing, it might be best to use it for surveys, too. Either way—whether you've picked one of the survey apps in this roundup or have rediscovered a survey tool built into an app you already rely on—what's important is that you have a tool that makes it easy to build surveys. Now that you've picked an app to build your survey, and have put together the questions you need answered, there's one more thing you need: automation. Your new survey builder is likely great, with dashboards and notifications and reports and more. But chances are, you'll want something more—better ways to analyze your data, follow up with people who filled out your survey, and automatically send your survey to your new customers. Here are some great ways to automatically send out your survey, thank and follow up with respondents, analyze your data, and make your survey fit into your workflow. You may be able to do some of these things with your app itself. For everything else, use Zapier, an automation tool that works with 1,000+ apps, including many of the survey tools in this roundup. If you want to survey your customers, you'll need to do more than just share a link to your survey on social networks. 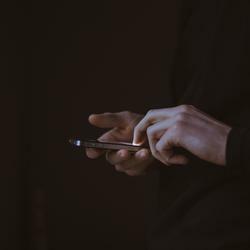 You might want to find out what each of your new customers think about your app, site, or store. For that, connect your eCommerce platform or payments app to your survey builder, and have it send a survey invitation to each of your new customers. If you'd like to get your survey responses via email, there's likely a setting for that in your survey builder dashboard. Those emails won't be very customizable, however, so instead, you can use Zapier to send you an email with just the survey info you'd like to see. You could get the full survey results each time, or just a quick message to let you know of a new submission. That's why the UP Global team uses Zapier to send email notifications of their new SurveyGizmo survey responses, to help manage Startup Weekend and their interactions with their sponsor, Coca-Cola. "With 10,000 volunteers in more than 110 countries, coordinating volunteers and Coke representatives is no small feat," says Mitchell Cuevas, senior marketing director at UP Global. But it's easier with Zapier. All they need is a Zap that watches for survey responses, then sends out email notifications to various team members based on where the response is from. "For example, if a volunteer selects Cambodia as his location, an email will be sent to the Coke representative in Cambodia containing all pertinent information and details drawn directly from the SurveyGizmo form," says Cuevas. 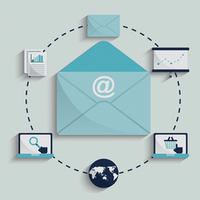 Managing surveys in a large team can be simple with customized email notifications. Don't start copying and pasting your survey result into your notes app or a spreadsheet—and don't wait until your survey is over to download all the results. Zapier can copy your new survey results automatically to your favorite spreadsheet app, word processor, notebook tool, or database. The Once a Month Meals team uses Zapier's Google Sheets integration for just that. Whenever their SurveyMonkey applicant survey is filled out, their Zap copies the survey data into different worksheets in the spreadsheet based on types of meals the applicant can cook. Their team can then find cooks for each type of menu just by opening the correct sheet. That simple automation has helped their team work far more efficiently. "It saves us quite a bit of administration time as we don't have to export and sort each time we need to find a new person or look at the information provided," says Once a Month Meals founder Tricia Callahan. No matter which apps your team uses to store your data and collaborate, you'll be able to work together on survey data far more easily if it's in your favorite tools instead of hidden inside your survey builder. You can list entries in a spreadsheet, save them to your notebook, or even generate unique documents automatically based on each survey response. Want an easy way to keep track of who's taken your survey? If you're sending your survey to your existing contacts, or the leads you've been working with in your CRM, then you'll want to note their survey responses right along with their other contact info. Just connect your survey builder to your CRM app—and make sure your survey asks for an email address—and each person's survey answers can show up on their profile in your CRM automatically. It's not all about your own records. Your contacts and customers took the time to take your survey, so it'd be nice for you to take a minute and say thank you. But it doesn't even have to take a minute of your time. All you need to do is have Zapier automatically send an email to each person who fills out your survey. 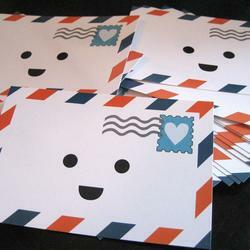 You could even include extra info about your company, or perhaps a special coupon code as an extra thanks. Or, if you want to make sure you keep a long-term connection, add your contacts to your email newsletter list. That way, they'll know as soon as you act on the feedback in the survey, and perhaps you can turn your survey focus group into your next customer base. Many great survey apps are already integrated with Zapier, but if your favorite survey builder doesn't work with Zapier yet, don't fret. If it supports webhooks or lets you subscribe to a feed of your results, you could use those to add your survey app to Zapier on your own. Otherwise, almost every survey app will send you email notifications when your survey is filled out, and you can use those to integrate with other apps. Just use the free Zapier Email Parser, or for more advanced features, try Mailparser.io. Forward your emails to the Zapier Email Parser, or add your Zapier Email Parser address as your notifications email in your survey app. Then, teach the Zapier Email Parser which parts of the emails include important survey information. Once that's done, you can connect your Parser account to any other app in Zapier. That way, you save your survey results, add your respondents to your CRM and email lists, and more automatically. Now that you've learned the basics you need to build a survey and have found a survey app to use, you're ready to create an amazing survey and gather the data you need. But what will you do with all that data? That's what Chapter 8 is for. It's an in-depth guide to optimizing your survey and turning your data into meaningful graphs—complete with template spreadsheets to help you easily analyze your survey data. 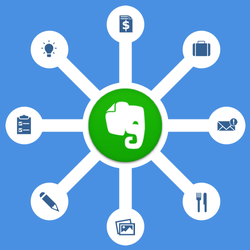 Originally published in June 2016, this post was updated by Emily Esposito in March 2019 with each app's latest features and pricing, and with great new survey apps including Survey Anyplace, YesInsights, and Surveybot. Image Credits: Clipboard photo by Dave Crosby.